Expect a different level of plumbing experience with a qualified plumber in Costa Mesa, CA. Here at OC Plumbing Pros, our plumbers are equipped with the right skills to perform any plumbing job competently. This helps us manage our time better, reducing overhead costs in the process, the reason why we can afford to offer our services at the most reasonable rates. Contact us if you do not know what to do with a plumbing leak in your home. Call us for plumbing repair or to perform general cleaning, and expect our Costa Mesa plumber to be right over in one hour. It takes years for a plumber to get his or her license, and that type of experience and skill shouldn’t be taken lightly. Ironically, they end up spending more on labor and materials. Call us 24/7 at (949) 371-8413. Professional Water Heater Installation and Repairs: We understand how you will feel when your water heater fails at some point. If it is fairly new, perhaps, it needs just a little tweak here and there to get it up and running again. While there, we can also see if you are not overloading or overusing your heater at all. However, as often the case, we always fear the worst. Our experts can also determine if your unit is appropriate for your daily requirements, and advise you accordingly. Drain Clogged? We Can Solve That Problem For You: People tend to overlook the condition of the downspouts and drains. But then again, that’s nothing new as homeowners are typically not proactive when it comes to any part of their plumbing system. Our wire cameras can follow through the drain and find out exactly where the problem is. More savings for you, of course. Detecting and Repairing Hard-to-Find leaks: Some leaks, just like slab leaks, for instance, may be hidden somewhere in your Costa Mesa property, and they can be difficult to identify, so save yourself the hassle and call on our experts to determine where the leaks are, and make the necessary repairs. Then you really have a problem on your hands. Don’t wait for the problem to worsen, call us now and our modern detection tools will be able to pinpoint the leak even without breaking your walls or floors first. If we can save you a lot of money, then we go home happy. Water leaks can lead to structural damage, the development of mold, and money loss from having to pay higher water bills. Emergency Plumber Costa Mesa – Call Us Now! 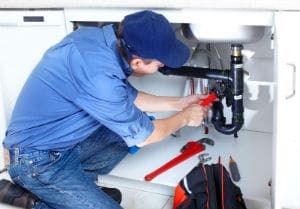 We Provide Re-piping, Garbage Disposal Repair and Installation Services: Building code requirements in Costa Mesa mandate that you hire licensed professional plumbers to lay down the pipes in your house or office. Do not make the mistake of attempting to repair it yourself, because without sufficient knowledge and skills, you can end up damaging your unit. Why are we mentioning this? Whether you have a leaky pipe underneath floor boards and ceramic tiles, we have the equipment to limit the damage to the smallest area possible, which would be to your advantage since you can save on materials and labor. Worry Not About Toilet Installations and Repairs: We understand your frustration when your toilet is leaking, broken, or clogged. Besides compromising comfort, it can also compromise your health, more so if the problem occurs in your home. Have peace of mind that our team will address your situation right away. This is why you don’t delay right away. 24/7 Emergency Services Available At OC Plumbing Pros: That’s why we have a hotline that you can call anytime, anywhere you are in Costa Mesa, CA. Just like in hospitals, emergency cases will be treated accordingly. As soon as you notice anything that is not quite right with your plumbing system, give us a call so we can respond at once. Plumbing issues can affect your daily activities, and, when not fixed right away, they can have unfortunate effects not just on your property, but on your health, too. Our Costa Mesa Plumbers At Your Ready Service Today! We guarantee an experience like no other when you connect with our plumbing contractors today. We do this through the experience of our technicians, and the tools and equipment we’ve acquired through the years. Ultimately, you are the only who will decide on which of these options is the best choice. Contact us today so you can have a better appreciation of OC Plumbing Pros plumbing repair and installation services. Call us today at (949) 371-8413!